If you are familiar with the series MacGyver then you will be aware of the fact it is known for the cool stuff MacGyver created out of almost nothing. He would solve impossible problems by creating something amazing out of whatever he could find. 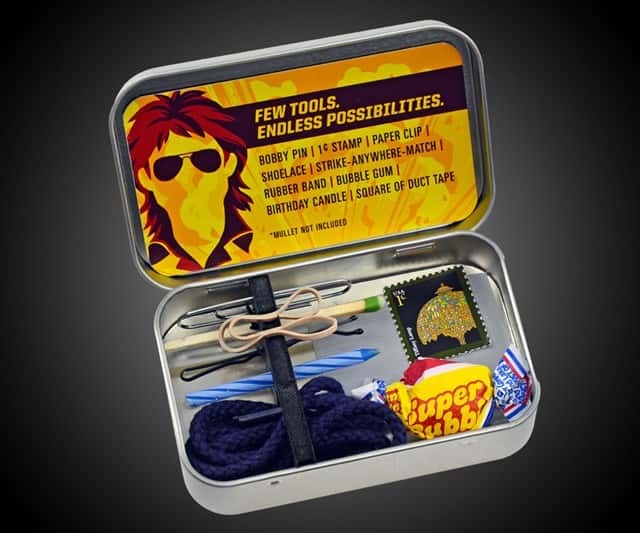 Now you can try it yourself with this awesome MacGyver Toolkit. A fun gift idea for any MacGyver fan. If you have never watched MacGyver or if you don't remember how cool it was here are some awesome moments. ~MacGyver stopped a missile from detonating with a paperclip. ~He escaped from a plane by attaching a paruchute to a car and driving it out of the plane. ~He once created an electronic jammer from kitchen appliances. ~MacGyver turned a pipe into a torpedo to escape from a basement.